Magnesium is an indispensable element for - amongst others - plants. In plants, it represents a building block for chlorophyll (leaf green), and therefore, it is essential for photosynthesis. At the same time, magnesium plays an important role in the energy transfer. Together with calcium, it is also a component of tap water, influencing water hardness. Inorganic magnesium fertilizers are produced using the same bases that are used to produce potassium fertilizers. Magnesium is indispensable to plants as it is essential for photosynthesis. Represents a building block for chlorophyll. Cloudy, vague yellow spots between the veins. Spray with a 2% solution of Epsom salts every 4-5 days during about a week. When there is a shortage, the leaf green in the medium-old leaves under the flowering top will be broken up, and the magnesium will be transported into the young parts of the plant. This breakdown is visible as rusty brown spots and/ or vague, cloudy, yellow spots between the veins. A slight shortage of magnesium hardly affects flowering, although the development of the flowers make the deficiency symptoms worse. Signs of a deficiency first appear around the 4th-6th week. 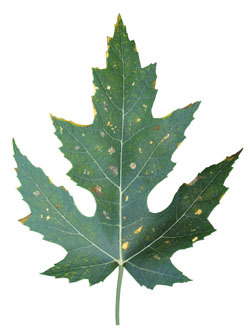 Small, rusty brown spots and/or cloudy yellow flecks appear in the middle-aged leaves (under the top of the plant). The color of the young leaves and the fruit development are not affected. The size and number of rust-brown spots on the leaves increase. The symptoms spread out over the whole plant, which looks ill. When the shortage becomes acute, the younger leaves are also affected and the flower production will be reduced. A very wet, cold and/or acidic root environment. A high quantity of potassium, ammonia and/or calcium (for instance high concentrations of calcium carbonate in drinking water, or clay potting mixes rich in calcium) in comparison with the quantity of magnesium. A limited root system and heavy plant demands. A high EC in the growing medium, which hinders evaporation. When a shortage is diagnosed, the best thing to do is to spray with a 2% solution of Epsom salts. Fertilization via the roots: Inorganic: Epsom salts on hydroponics or Kieserite (magnesium sulphate mono hydrate). Organic: composted turkey or cow manure. Rectify the possible causes: In potting mixes, when the pH is too low (less than 5), use magnesium containing calcium fertilizers. In hydro, temporarily apply a nutrient solution with a higher pH (6.5). When the EC is too high, rinse and/or temporarily feed with drinking water only. When growing indoors, keep the root temperature between 20 - 25 degrees Celsius. A little extra magnesium is not particularly harmful. When growing in potting mixes, excessive quantities of magnesium do not appear quickly. Too much magnesium inhibits the uptake of calcium, and the plant displays general symptoms of an excess of salts; stunted growth, and dark-colored vegetation.